Positive Displacement (PD) pumps create pulsation and hydraulic shock due to the reciprocating nature of their stroking action, potentially damaging piping and system components. 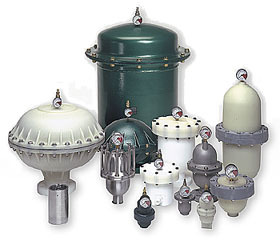 SENTRY® Pulsation Dampeners and Surge Suppressors remove virtually all system shock, enhancing the performance and reliability of fluid flow in municipal, industrial, sanitary and chemical transfer applications. SENTRY Pulsation Dampeners use a compressed gas separated by a bladder from the process fluid like a shock absorber. During the pump's discharge stroke, fluid pressure displaces the bladder, compressing the trapped gas. During the pump's next cycle, fluid flow stops momentarily causing expansion of the compressed gas, forcing the bladder to push accumulated fluid back into the discharge line. This fills the void created by cycle shift and dampens pulsation up to 99%. Protects pumps, piping, valves, fittings, meters and in-line instrumentation from damaging pulsations, cavitation, thermal expansion, hydraulic shock and water hammer. Prevent destructive pressure surges caused by pump startup and shutdown. Prevent hydraulic shock resulting from emergency valve closure and other equipment shutdown. Prevent agitation, foaming, splashing and degradation of product. Ensure accuracy, longevity and repeatability of flow meters and gauges. Ensure a smooth, steady flow in metering and chemical injection processes. Ensure uniform and continuous application in spraying and coating processes. Ensure proper measurement, flow and filling applications of food and pharmaceutical products. Ensure consistent flow when dosing, blending or proportioning process additives. Ensure a smooth transfer of viscous or abrasive fluids. Positive displacement pumps contain an inlet valve that alternately opens and closes, creating an acceleration and deceleration of fluid into the pump. Sentry Inlet Stabilizers minimize these pressure fluctuations and acceleration head losses by preventing fluid column separation at the pump's inlet. The patented* "J" Model air control allows for pressure or vacuum settings and is adjustable for suction lift or positive inlet pump conditions. Protect pumps, valves, diaphragms and pistons from excess stress and strain. Protect inlet system components from vibration and fatigue. Prevent premature system component failure and cavitation. Prevent gauge damage due to vibration. Ensure steady inlet flow conditions to extend diaphragm life. Ensure complete chamber fill to maximize component service life. Ensure accuracy of inlet side gauges. Sentry Pulsation Dampeners, Surge Suppressors and Inlet Stabilizers come in a full range of chemically resistant materials for even the most corrosive applications. The simple, reliable design allows for quick installation and easy in-line maintenance. All Sentry housings are made in the USA, and each unit is tested at design pressure or higher to assure proper function and leak-free operation. * Maximum PSI rated for ambient temperatures. ** Reflects entire temperature range for all available materials. Consult us on specific materials. The chargeable model has a Schrader type charging valve that allows for a predetermined pressure charge to be applied and held in the dampener. No permanent source of compressed gas is required to be attached to the unit. The chargeable models are used primarily with metering, piston and peristaltic pumps for pulsation dampening. Chargeable models are also used for surge suppression to prevent water hammer from quick closing valves, for make-up fluid to prevent pump cycling and for suppression of pump start up or shut down pressure spikes. The patented inlet stabilizer air control (U.S. Patent No. 6,089,837) consists of a compound pressure gauge, a pressure/vacuum tight ball valve and a venturi valve. When compressed air is passed through the venturi valve at high speed, a low pressure area is created which is used to evacuate the air from the stabilizer, creating a vacuum internally. Conversely, when the flow of air through the venturi valve is diverted into the stabilizer, a pressure charge is obtained. When pump inlet conditions are optimized, pump efficiency is maximized. An automatic poppet type valve located in the non-wetted section of the dampener allows for an increase in compressed air pressure to balance an increase in system liquid pressure. As liquid system pressure increases, the bladder is pushed further up into the dampener until it contacts the internal automatic valve. This contact opens the valve and allows an increase of compressed air to enter the dampener. When the air pressure inside the dampener equals the system liquid pressure, the dampener is in balance and pulsations are minimized. If a change in pressure occurs this process is repeated. Automatic units are designed for use on air operated diaphragm pumps in systems with a varying discharge pressure. The adjustable model uses a self-relieving regulator to set dampener pressure. A compressed air line must be permanently attached to the regulator. The regulator allows for an easy, convenient method for readjusting the dampener pressure if the system fluid pressure changes. Adjustable units are designed for use on air operated diaphragm pumps in systems with a constant discharge pressure.